[Update after the gig:] Kiitos for a fantastic day! My slides are available for download (pdf, 6 Mb) and for browsing at Slideshare (or below ;). At Bambuser you find the archived version of my live video from the Workshop intro. Let’s go creatzy! Turku, European Capital of Culture 2011, is organizing quite a substantial number of events. Some of them takes place already in 2010. One is Creative Buzz, October 28 (hashtag #creativebuzz). It’s a full day seminar, featuring speakers Timo Parkkola, Annika Blomberg, Alf Rehn, Outi Raatikainen, Eija Mäkirintala, Petra Tarjanne, Antti Pitkänen, Outi Raatikainen, Eija Mäkirinta, Jarmo Röksä, Saara Taalas and myself. Various forms of Social media have become widely known. But many people still question their use and value. Why is that so? Let’s look at some answers and dig into a number of inspiring cases where creativity and innovation play important roles. Beyond that, in front of us lies a number of profound societal shifts, partly caused by social media. These must be recognized and carefully managed. [Update after the gig] Thank you very much for an inspiring Piiri afternoon! I have uploaded my handout slide miniatures (pdf, 5.7 Mb), and as a browsable presentation at Slideshare. Feel free to also take a look at: whats said under the hashtag #piiri2010; the Dieselcam; Karobellas YouTube video Tampere-guide, and how fifth graders describe Europe at Fiskis5an.se. I skipped two slides that gives a glipmse of some new cool stuff. Instead, check out: Project Natal (new forms of interaction) and Streetmuseum (artificial reality). PLACE is a Finnish ”company specialized in place marketing and providing branding services to the public sector”. During the two day Piiri 2010 event in Tampere they organize a number of presentations around success stories, place marketing among young people (18-35), and recruiting in public sector and need for new experts. Within the latter I have been invited to talk about Social media as a tool of recruiting young people and families. All in all this look like a really interesting event, moderated by Anna Sorainen (who manage to hook me up for many gigs in Finland – thanks!). Among the other speakers are Irene Roivainen (city of Tampere), Professor Alf Rehn (Åbo Akademi), Managing director Jari Latva-Rasku (Tractus Ltd), Mayor Riitta El-Nemr (Kristiinankaupunki), CIO Conny Svensson (Falköping), Professor Howy Jacobs (University of Tampere), Communications director Jari Seppälä (Suomen Kuntaliitto), Sanna-Maria Röör (Tampere), and Lasse Paananen (Louva Tampere). 2010-03-25: IAB Finland: Bigger than brands? [Update after the gig] Whow, thanks – a wonderful afternoon! Who says that Finns are reserved and quiet? You are a great crowd (who perhaps could tweet with the hash tag #GrandOne a little bit more ;). Anyway, my slides are uploaded as a pdf (6,3 Mb) and published for your browsing at Slideshare. A link to Robin Teigland’s slides on Leveraging social networks… and one to Daniel Pink’s book Drive: the surprising truth about what motivates us. If you want to join my efforts in creating a better start in life for our younger ones, please check out RichardGatarski.com. Now, soon time for the Grand One Gala and Awards! IAB Finland, a member of IAB Europe, ”exists to support and promote the growth of the digital and interactive marketing industry”. This day is devoted to the IBA Grand One Seminar, (in English:) Digital marketing Decade – The courage to confront the impact of consumer. The speakers include Jukka-Pekka Vuori (chairman of the board IAB Finland), Joris van Heukelom (director Digital Publishing, Sanoma Digital), Jyri Engeström, (entreprenur, co-founder of Jaiku), Ari Ojansivu, and Saila-Mari Kohtala (M&M). Consfused about my references to the presenters? 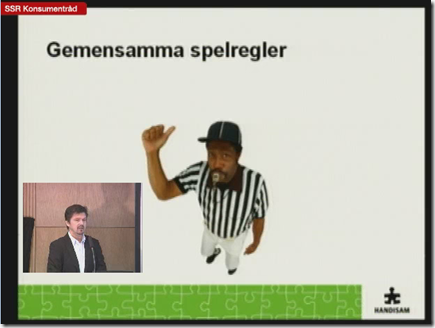 Well, I am the only one who has a link to my web presence in IAB’s presentation of the speakers. So I googled around and linked to what I found. Furthermore, I wonder – is there any official hash tag? Is this Bigger than Brands? Consumerism and brand management were formed in a mass media context. Online, real time, and social media are profoundly different. Is better brand management the answer? F-Secure is ”the global leader in providing security as a service through operators”. SPECIES is their ”worldwide ecosystem conference for F-Secure Operator Partners. Its objective is to increase the exchange of best practices among participating companies and to enable a dynamic environment for networking”. How you can get excited about things you have always worked with /about things you don’t have a clue what they are / about things you know are the right ones (even if others don’t) , and keep that enthusiasm despite the obstacles you may face? Whow, that is a good question! Tho two other key notes will be delivered by Dr. Graeme Codrington (TomorrowToday) and Timo Vuorensola (AD, Director, Energiaproductions, Wreckamovie). I highly recommend checking them out! (The event is by invitation only, but you can google or follow their links, in particular to Codrington’s After Shock and Vuoransola’s Wreckamovie. If you make stage presentations, you will sooner or later find yourself in a situation when your talk is streamed live or recorded on video. Here are some tips on how you can (re)design your slides and your act to support an excellent performance for people not physically present. Nobody could have missed the fact that web video has become immensively popular. This includes the cases when various meetings (e.g. conferences and seminars) are live streamed on the Web, and sometimes made available for later viewing. During 2009 I have been engaged in the production of a number of such live streamed events. These have ranged from simple setups with just a smartphone as the camera, to more complex settings involving the live mixing of multiple cameras with graphics and simultaneous broadcasts of multiple channels from the same event. I have briefly documented an example of the latter at Production setup event for 2009-11-27. Of the many lessons we have learned so far, I would like to share some insights regarding presenters and their visual support, be it slides from Microsoft Powerpoint, Apple Keynote, Prezi or any other presentation tool. Please note that the ideas presented here are based on my personal experiences and preferences. I am not making any claims that the advice given is supported by any kind of scientific or formal practical research. There are basically three main media sources in a live presentation: the sound, the speaker, and the slides. Let us start by looking into what goes from stage to web/video space. Quite frequently the ”video audience” will use only the sound. For example, when listening as a background while doing other things on their PC, or just listening to your talk in an mp3 player. If the sound quality is bad, people will most likely give up. Imperfect slides might on the other hand just be overlooked. The presenter is of course equally important. Giving a presentation is a performance act. The video producer should strive to provide a good image of the speaker’s face and body. Whereas facial close-ups support the connection with viewers, one must not forget the importance of body language. Facilitating both is a daunting task for the producer, especially when the speaker move around the stage, sometimes even running back and forth. You have a choice, be energetic (and stress the producer); be static (and bore the auditorium); or be dynamic by balancing both forms of kinetic approaches in a smart fashion. Slides vary between useless and crucial. I will not go into detail here about what one should do in order to produce good slides. Suffice to say is that your slides should be useful, otherwise skip them. To learn more, I suggest you dig into Garr Reynold’s fantastic Presentation Zen. In that blog Mr Reynold by the way provides excellent insights about talks way beyond the slides part. Okay, let us now focus on you as a speaker and your slides. When it comes to people in the room, it’s up to them whether to look at you or the images you show. Hopefully the slides by themselves are always made available before or after the presentation. Either published as pdf-files, or on services like Slideshare. When the meeting is watched through a live stream and/or recorded on video, the situation is different. In that case the producer must decide on what to include, and how. For some years we have had the option to afterwards publish a web page where the video recording of the stage appearance is synchronized with the slides. There are an abundance of services and post production tools for that. For example, Omnisio (now aquired by Google) offers such tools. 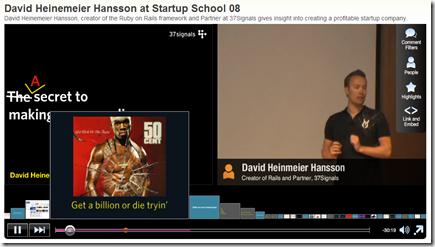 As illustrated in the screen shot below (from Startup School 08), viewers can see the slides (left), the speaker (right), and navigate (bottom part). Another way is to integrate, or mix, the speaker with the slides. That is, include the speaker and the slides in one single video stream/recording. One way of integrating is to show either the speaker/stage or the slide being talked about. Another way is to mix in the speaker into the slide, as illustrated here from an archived live streamed recording we did for SSR Konsument. Which method, synchronization or integration, is better should of course be determined by the situation. In general, I am betting on integration. Future will tell, but for the moment my impression is that we are slowly leaving the desktop/laptop environment for viewing situations that are mobile. In other words viewers might not be able to run the software applications necessary to watch synchronized presentations. Furthermore, synchronized presentations require some, sometimes a lot, of post production. That is a time consuming and costly process. Hence, in many cases it is simply more cost effective to produce a single live mixed recording. So, whenever you as a presenter suspect that your presentation will be recorded with your slides integrated, I suggest you prepare your slides for that. Given the above, here are some tips on how you can design your slides for a nice result when the talk ends up in a video format. While everyone seems to be crazy about full HD, mobile devices have relatively low resolution. In 320×240 (limitation in many mobile phones) most slides are still usable, but copy text might become unreadable,. Smart phones, like the iPhone and various flavors of the Android and Windows mobile, are slightly better and typically offers 320×480 (or 480×320 in landscape mode). Therefore, if your slides feature important text information (e.g. an e-mail or web address), make sure it’s readable in low resolution. Leave room for video integration. It might very well be that the producer will integrate the stage camera into your slide(s). In particular when you talk about the slide(s) for a longer time, or when the emphasis is more on your visuals than yourself. Trust me, the producer will love you if you leave som empty space in your slide where that video nicely can be integrated without destroying the slide. The broadcasting term DOG (Digital On-screen Graphic, or ”corner bug”) refers to the watermark station logo, typically imposed in the upper right corner of the screen. This graphic might be inserted by the producer when the recording is made, or later by the video sharing service. Sometimes the DOG appears throughout the whole video, at other times just for a short while when the video starts playing. Again, consider leaving some room for the DOG in your slide. The lower third is ”a graphic placed in the lower area of the screen, though not necessarily the entire lower third of it as the name suggests”. This part of the screen is frequently used to present subtitles and captions (such as the name of the speaker). In addition, many web sharing services (like YouTube) use this area to superimpose advertising content on top of the video. Hence, if you have important information in that part of the slide, it might occasionally be hidden by other stuff. If you are a well trained speaker you understand the importance of having a good contact with the audience. Live streaming and video recording adds the dimensions of a non visible audience and the appearance of cameras. Make sure you know where the camera is, and direct your attention towards it when useful. Remember, people are watching you through the camera, give video viewers too a smile. Point in the proper direction. There are situations when speakers direct the attention to a slide by pointing to it with their arm/hand. In such cases, it is important to consider where you might appear in the video. If you have left some space for video integration in one side of your slides, then make sure you are standing on the same side of your slide. Otherwise your hand will point out from the slide, not into it. Be careful when fronting your slides. Sometimes it is possible for you to walk up to the screen and point in it, on the slight expense of obscuring the image. While this occasionally looks OK on stage, it might not look so good in the video. Depending on the quality of the camera and its operator, it is everything from impossible to difficult to get a good contrast. Either you are just in the way, or you are the only visible object. Contrast is king – and difficult on video. Depending on the setting, you might be able to have a subtle interaction with the streaming/recording producer. Try to keep an eye on him or her. Maybe you can on beforehand agree on signs when you should start, thus giving room for a vignette or simply make sure that everything is good to go. At other times the producer might want to call to your attention that your mike needs to be repositioned. 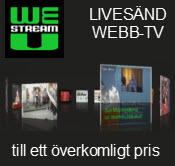 I hope my concerns and advice regarding how to prepare a presentation for live streaming and webb video are useful. Please let us know by commenting here if you have things to add or if the above raised any questions that needs further attention.